Blair, Hugh, D.D., eldest son of John Blair, merchant. Edinburgh, was born at Edinburgh, April 7, 1718. In 1730 he entered the University of Edinburgh, where he graduated M.A. in 1739. In 1742 he was ordained parish minister of Collessie, in Fife, became, in 1743, second minister of the Canongate, Edinburgh, in 1754 minister of Lady Yester's, and in 1758 joint minister of the High Church (now styled St. Giles's Cathedral). In 1762, while still retaining his pastoral charge, he was appointed the first Professor of Rhetoric in the University of Edinburgh—a chair founded for him. He received the degree of D.D. from the University of St. Andrews, in 1757. He died in Edinburgh, Dec. 27, 1800. In 1744 Dr. Blair was appointed a member of the Committee of Assembly which compiled the Translations and Paraphrases of 1745, and in 1775 of that which revised and enlarged them. To him are ascribed by the Rev. W. Thomson and the Rev. Dr. Hew Scott, Nos. 4, 33, 34, 44, of the 1781 collection. He is also credited with the alterations made on Paraphrases 32 and 57, in 1745-51, and on Paraphrase 20, in 1781. The Rev. J. W. Macmeeken would ascribe these 4 Paraphrases to his second cousin, the Rev. Robert Blair, author of The Grave [eldest son of the Rev. David Blair, born in Edinburgh, 1699, ordained Parish minister of Athelstaneford, East Lothian, in 1731,appointed, in 1742,a number of the Committee which compiled the 1745 collection, died at Atholstaneford. Feb. 4, 1746]. Dr. C. Rogers, in his Lyra Britannica (pp. 66 & 664, ed. 1867) holds that, though Dr. Hugh Blair may have altered Paraphrases 44 and 57, neither he, nor Robert Blair, wrote any original hymns. While the weight of opinion and of probability is in favour of Dr. Hugh Blair, no very definite evidence is presented on either side, though the records of the Presbytery of Edinburgh in 1748 show Dr. Hugh Blair as selected to revise Nos. 18 (7 in 1781), 21 (46 in 1781), and probably others. 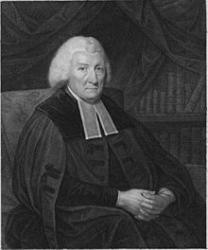 Hugh Blair FRSE (7 April 1718 – 27 December 1800) was a Scottish minister of religion, author and rhetorician, considered one of the first great theorists of written discourse. As a minister of the Church of Scotland, and occupant of the Chair of Rhetoric and Belles Lettres at the University of Edinburgh, Blair's teachings had a great impact in both the spiritual and the secular realms. Best known for Sermons, a five volume endorsement of practical Christian morality, and Lectures on Rhetoric and Belles Lettres, a prescriptive guide on composition, Blair was a valuable part of the Scottish Enlightenment.